Home Nightclubs yearly NYE bash was this year called "Sublime NYE" and featured the Number 3 DJ in the world, Armin Van Burren. 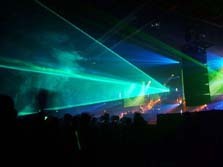 Held at Sydney's Hordern Pavilion, the lighting equipment was supplied by CLS. Being primarily a Trance Party where the kids all face the front, production designer, lighting designer Brad Wright decided to move away from his usual style of dance party design and instead went for a more rock and roll stage based look. 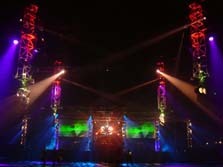 The end design featured a wall of lights, lasers, vision and audio that spanned the width of the Hordern Pillars and reached to the top of the stage roof (30m wide x 8m high). 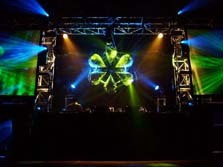 The dance floor was left quite simple featuring 4 x 4m vertical trusses with associated lighting. 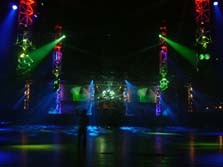 Dance Floor Lighting Design: 8 x MAC2000 profile, 8 x MAC600, 8 x High End Dataflash, 8 x Par 56, 8 x DataFlash, 4 x 4m Box Truss Verticals, Motors, Rigging and Cable Truss as needed, 4 x Custom Sublime "skulls".